What Twitter is to me. "These are real people I want to connect with and share interests." I joined this thing called Twitter. If you want to know what drinking from a fire hose is like, join the community and try following people of like interests. I follow just about every one whom interests me if you follow me first I do check you out your tweets and your attached web site. If you are right or left on politics, I will follow. One thing I have learned over the years is do not let politics or religion get in the way of friendships or acquaintances we are all different and have opinions this is what makes the world interesting. If all of your tweets consist of promoting your affiliate web site and there is no personal substance there I will not follow back. 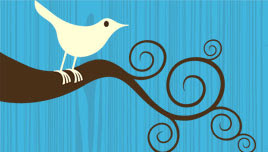 Twitter has been defined as social networking mico-blogging in 140 characters or less. So what can you really say in that amount of restricted space? Obviously quite a bit, the reason for this restriction is apparently due to cellular phone sms restrictions. Twitter set it up this way so users can Tweet via their cell phones. “Now that’s cool!” not that I will use this feature. December 15th 2008 I finally took the plunge and signed up for their free service. After a few days of lurking and small tweets here and there I quickly found out this is a medium for actually talking to people, not just marketing. “And flush down the toilet there went all of my dreams of just marketing stuff.” These are real people I want to connect with and share interests. @nanse was one of the first to help me out with twitter, she gave me ideas and directions to get started with new friends, and suggested some really good folks to follow. There are many more folks that I should have mentioned and probably will in the future but if you are looking to make friends “Not followers” Tweet out loud. Just be careful it is addicting and as of today I am getting close to 300 friends and can’t keep up with all of them. Like drinking from a fire hose. Who has helped you? Who do you follow and why?
" if you are looking to make friends “Not followers” Tweet out loud. " - I love that! So very true. I think many people come to Twitter thinking it will be a quick way to market to people and then realize the power of making true, sincere connections. I love your writing style and this post just summarizes the whole point about having twitter. I do follow people as well that can show me important links as well as random fun stuff. If I see someone who seems to just advertise their services and think twitter is the way to get me, I don't follow back. Twitter is about building a community of people with similar interests.